Janeen was nine when she came to live with us in Greece. I smile when I think of her at that age. It was Janeen’s first time out of Alaska, and our first time living with a child. For all of us, the world was new and filled with possibilities. For special breakfasts, Janeen loved baked pancakes (Dutch babies). We called them “puffy pancakes” because, like the Yorkshire pudding they resemble, the pancakes puff up beautifully in the oven. When Janeen returned to Alaska for school, she wanted to make sure she knew how to make “puffy pancakes.” The proportions were easy, I explained; just follow the Rule of 3: 3 eggs, 3 quarter cups of flour, 3 quarter cups of milk, 3 Tbsp. sugar. I wrote down the recipe, in case she forgot. Because I repeated the Rule of 3 so many times, I’ve never forgotten the recipe for puffy pancakes. I think of Janeen every time I make them. Puffy pancakes may be eaten plain, with berries and cream, or with a light sprinkling of powdered sugar and a squeeze of lemon juice (my favorite). I also bake them with an apple, cinnamon, and sugar topping. As with apple pies, the pancake topping tastes best when more than one type of apple is used to make it. Most recently, I made this with 2 Granny Smith apples and 1 Empire apple, all from my Full Circle Farm CSA box. Over the years, I've made this with every type of apple available, and it tastes wonderful no matter what kind is used. The amount of cinnamon added to the apple topping depends on the kind of cinnamon you are using and how long it has been sitting in your cupboard. If I use regular grocery store cinnamon of uncertain age and often of lower grade than that available from specialty stores, I use 2 teaspoons of cinnamon. If I use delicate “true” cinnamon from Ceylon, I add 3 teaspoons, and if I use spicy Vietnamese “cassia” cinnamon, I add 1 teaspoon. If you are unsure about the strength of your cinnamon, stir in 1 teaspoon and taste the apples. Add more cinnamon, as needed. 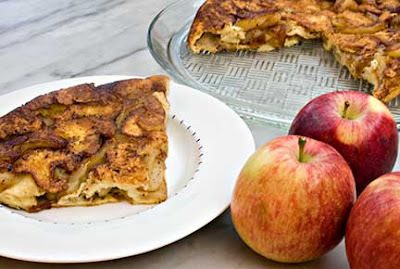 Cinnamon is an essential flavor in Apple Pancakes, and is balanced by the plain batter. No matter which version I make, puffy pancakes are a showy, but easy, treat. I prefer making this in a 10-inch seasoned, cast-iron skillet, but I’ve also successfully made it in a 10-inch Pyrex pie pan and a 9” aluminum cake pan. It can be made in any 10-inch, oven-proof, round pan. Whisk together the eggs, milk, flour, sugar, and salt until thoroughly blended and the batter is smooth. Place a 10” oven-proof pan in the preheated oven until it is heated through. Add the butter, and swirl it around the pan until the butter melts. Pour the batter into the hot buttered pan, return it to the oven, and bake for 20 – 25 minutes; do not open the door during the first 20 minutes while the pancake is baking. The pancake is done when the center is fully cooked, and the sides of the pancake have puffed up, forming a partial bowl. As with the Puffy Pancakes, I prefer making this in a 10-inch seasoned, cast-iron skillet, but I’ve also successfully made it in a 10-inch Pyrex pie pan and a 9” aluminum cake pan. It can be made in any 10-inch, oven-proof, round pan. Melt the butter in a 10-inch oven-proof pan. Add the apples, and turn them until all sides are coated with butter. Cook the apples over medium heat for 5 minutes. Stir in the sugar and cinnamon, and cook for 5 minutes, or until the apples start to soften. Whisk together the eggs, milk, flour, and salt until thoroughly blended and the batter is smooth. Evenly distribute the apples over the bottom of the pan. Pour the batter over the apples, and immediately put the hot pan into the preheated oven. Bake for 20 – 25 minutes; do not open the door during the first 20 minutes while the pancake is baking. The pancake is done when the center is fully cooked, and the sides are puffed up. 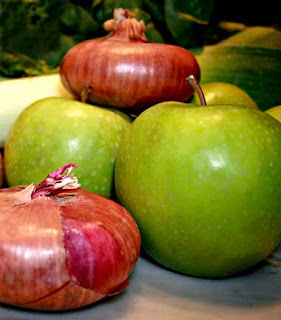 This is my entry for Fresh Produce of the Month: Apples sponsored by An Italian in the US, and my entry for Think Spice: Cinnamon sponsored by Sunita’s World. Yummy pancakes...and such a unique recipe...thanks. The Dutch Babies sound delicious...ice cream for breakfast with I say. Good morning, I have just hopped across several continents this morning and ended up on your site, found your Dutch Baby recipe, made it, and am eating it as I write this. Thank you. I'm in Southern California, reading my daughters blog in London (xochitlcooks) and bidding on menu for hope. 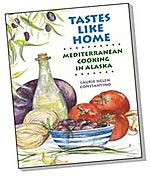 I found your cookbook's name intriguing so I was off to Alaska. On Christmas morning when I pick up my younger daugher and her boyfriend from the airport, I will bring them home and have them make your recipe, I think they will love it. Thank you again, Merry Christmas. I definitely have to try this one! If I'm organized I'll try it on the 26th. Another great story and recipe! Thanks for sharing! Sunita, I'm so glad you liked it! You gave me a good laugh Peter! I think it's untranslatable. You could probably get away with μηλόπιτα for the apple pancake, but we gave ourselves the giggles thinking of possible translations for Dutch babies! Anonymous, what a lovely comment, thank you so much. Menu for Hope is wonderful charity and I'm glad to hear that people are continuing to donate. I'm also very happy you enjoyed the Dutch Baby and I hope your family loves them as well. Thank you for telling me about your daughter's blog -- I've just been reading and enjoying it. Merry Christmas!! Cheryl, this is so easy to make, but it looks very impressive. Merry Christmas to you and your entire family! Have you learned any Κάλαντα Χριστουγέννων yet? These puffy pancakes with apples sound really good. Ice cream does sound like it would go well with these Peter. Kevin, call me crazy, but I think ice cream goes well with just about everything! The pancakes look delicious! Actually, I did not receive your email, but I just saw here that you wanted to send this for the FPOM event. Can you try to email me again? I'll send myself an email reminder about this post in any case. Thanks Marta! I did email you, but resent it just in case. Please let me know if it doesn't come through. I love apples! I haven't but the kids have. Izabella is singing morning, noon and night. I asked her to sing Jingle Bells in English and she refused, she's really into learning the new holiday songs this year. I'm not sure if I like this whole getting up early to sing thing! :) I'll let you know how it goes. Merry Christmas & Kali Hronia to you and yours as well!! Love pancakes and your recipe is so tempting. Merry Christmas. That's interesting. I've made some apple cake recently, which is quite similar to yours. I think that Dutch Babies are one of our favourite breakfast foods. I hope you have a wonderful holiday season with family and friends in Alaska. May it be all that you hope for and more with much love, peace and happiness. With apples, they sound perfect! When I'm through eating Christmas cookies for breakfast i might give these a try! Cheryl, I think it's sweet that Izabella is being melodious in the morning! Thanks, Ivy. Καλά Χριστούγεννα και Χρόνια Πολλά! Hi, Windy! Merry Christmas and Happy New Year to you too. I checked out your apple cake, which looks tasty. Although yours is more of a cake, complete with creaming butter and sugar and using baking powder for leavening, while mine is more of a simple, eggy, baked pancake. Thanks for stopping by! Val, thank you for the lovely holiday sentiments and I wish the same to you and yours. Katie, this is so easy to make. As for the Christmas cookies, I made the mistake of getting on the scale last night. No more for me this year, I've already done enough damage!! Looks really good. Happy Holiday! Yummy! Hope you had a great Christmas! Thanks Helene! Happy Holidays to you. Cris, we had a great Christmas and hope you did too!